ou can't think how hard fathers and mothers used to work and plan to get their children educated in the old days when there were no public schools. The Emersons did some planning, I can assure you. All the pictures of Ralph Waldo Emerson that I have happened to see show him as a man of middle age, with very smooth hair, and plain but very nice-looking clothes. He looks in these pictures as nurse Richards used to say of my father,--"as if he had just come out of the top bureau drawer." Well, Ralph Emerson did not always wear fine clothes, but I would not be a bit surprised if he always looked middle-aged. Boys who had as little fun as the Emerson boys had when they were growing up would not be expected to look young. In the end, Ralph became a minister, as well as a writer, and a lecturer, and a philosopher. His father and his grandfather had been ministers, too. I fancy it was trying to send all these minister-Emersons to school and college that kept each set of parents so poor. Ralph's father, William Emerson, did not care to be a minister. He wanted to live in a city and teach school, play his bass viol, and belong to musical or singing clubs. But his mother looked ready to cry when he told her this and said: "Why, William, it has taken all the money I had to send you through Harvard College. What good will it do you, if you do not become a preacher?" So, rather than grieve his mother, he agreed to fit himself for preaching. How he hoped he might be sent to some large town! But instead of that, he settled in a small place where neighbors lived two or three miles from each other. He was as lonesome as he could be. He was too poor to buy a horse and too busy to spend half his time walking, so he could not get very well acquainted with the families that came to hear him preach. Besides, his pay was small, and if the kind-hearted farmers had not brought him a ham, a leg of lamb, or a load of wood now and then, I don't see how he would have managed. In spite of all these hindrances, William saved a little money in five years. He bought a small farm and got married. As the years went by and there were children to feed, his preaching did not bring half the money they needed, so he taught school, his wife took boarders, and he--even--sold--his--beloved bass viol. And I do not think they felt that anything was too hard if only these children could go to college. Mrs. Emerson was very proud of her husband when he stood in the pulpit on Sundays, and used to shut her eyes and try to imagine how their boys would look in a pulpit. Finally good luck came their way. Mr. Emerson was asked to preach in Boston. Then he had the city life he loved, he heard good music, and could call on his friends three times a day if he wished, and the boys had fine schools. None of the children were over ten when this good man, Minister William, died. And then came the widow's struggle to educate them. The church members were kind to her; she took boarders again, and sewed and mended with never a complaint, so long as the boys could go to the Latin School. They saw how tired she got and kept wishing they could grow up faster, so they could earn money and let her rest. They helped her wash dishes, and they chopped wood and cleaned vegetables, while the other school-boys played ball, or swam, or skated. There were no play hours for them. They had but one overcoat between them. So they took turns wearing it. Some of the mean, cruel boys at school used to taunt them about it, singing out, when they came in sight: "Well, who is wearing the coat to-day?" A spinster aunt, Miss Mary Emerson, came to see the family often. She urged the boys to stand high in their classes and thought it would not hurt them to do without play. She read all the fine books aloud to them that she could borrow. Once a caller found her telling the boys stories of great heroes, late at night, so that they might forget that they had been without food for a day and a half! They were as poor as that! Ralph began to go to school when he was three and so was able to enter Harvard College when he was fourteen. He did not have to pay for his room at the president's house because he did errands for him. And to pay for his meals, he waited on tables. That was working to get an education, wasn't it? Ralph did not find fault because he had to work all the time that he was not studying; he was thinking of his mother. When he won a prize of thirty dollars for declaiming well, he sent it to his mother as fast as the mails could take it and asked her to buy a shawl for herself. But she had to take it to buy food for the smaller children! Ralph used to tell his brothers that he could not think of anything in this world that would make him so happy as to be able some day to buy a house for his dear mother and to see her living easily. The other boys,--Waldo, Charles, Buckley, and Edward,--proved to be fine scholars, like Ralph, but they were never strong. They were always having to hurry south, or across the ocean to get over some illness. The truth is they did not have enough to eat when they were little. Old maid aunts can tell stories of heroes every night in the year, but that will never take the place of bread and potatoes, eggs and milk. 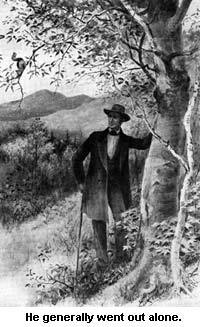 The Mountain called the Squirrel 'Little Prig'--"
It is rather nice to remember that after William Emerson had sold his bass viol, after all the pinching and saving of Mrs. William, and after going with half a coat, Ralph Waldo Emerson proved, in the end, to be such an uncommon man and scholar that his name is known the world over. Perhaps if all of us were as willing to study and work, and to keep studying and working, as the Sage of Concord was, there would be ever so many more famous Americans than there are to-day.